Can you name the factory across the way on Boardman Lake? This image is easily one of your editors’ favorites! 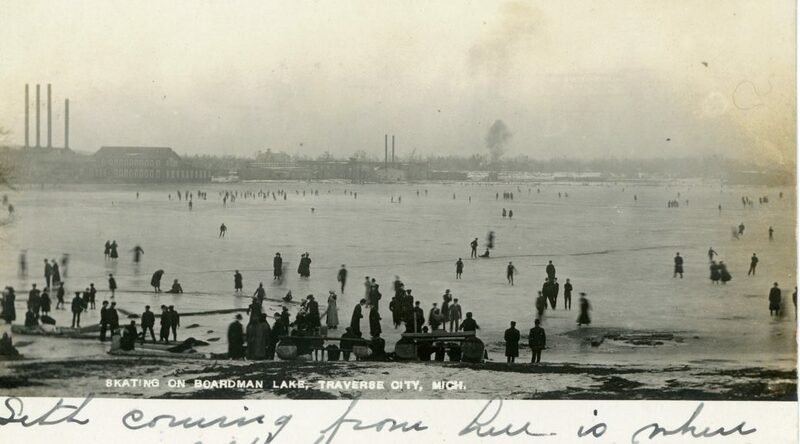 Taken about 1910, here is Boardman Lake, taken from the northern end and looking south. 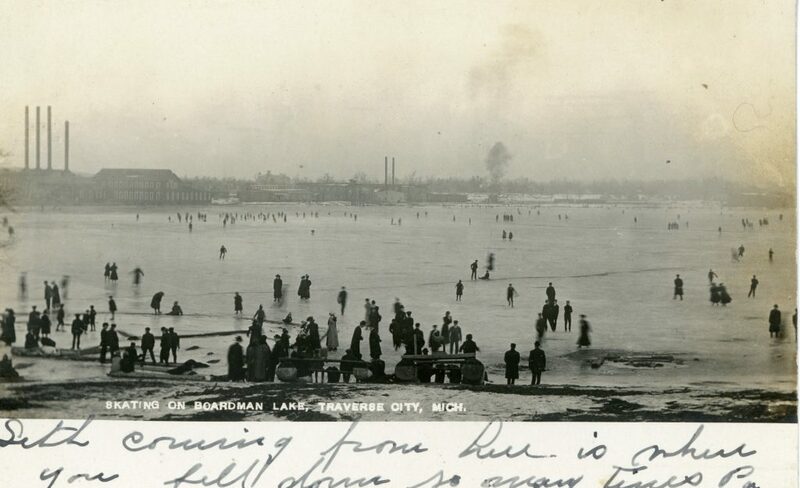 In the photograph, we see a number of fun-loving Traverse City residents ice skating, playing hockey, and in general enjoying a perfect frozen lake with no piles of snow to contend with. Solve the mystery of this image: What is that large factory shown on the background on the left? Bonus question: What building now sits where that factory was? Boardman Lake, ca. 1910. Image 718.000001.327, Traverse Area District Library Local History Collection. Bonus ? : Square Deal ?? Congrats, Biff! You’re our grand prize winner for this month’s edition of “Mystery Photo!” Way to correctly name that factory, which was the Oval Wood Dish Company. The Oval Wood Dish Company was the largest factory to be located on the lake: in fact, during its existence, it was the largest employer in town, hiring more than 600 workers at its peak. Besides oval wood dishes (used in packaging meats and other products), it made clothespins, wood flooring, and all kinds of items made from hardwood. Because local hardwoods had mostly been logged off, it moved to the state of New York in 1917 in order to take advantage of forests in that state. But, Square Deal Country Store is a little too far south… anyone else care to guess at the bonus question? The answer isn’t the Library either because it is built on the site of the former Beitner Factory. I believe TC’s wastewater treatment plant is the answer to the bonus question. Do you all think Mouse is on to something? I’m on pins and needles waiting for an answer!